vegan food at dosa truck! 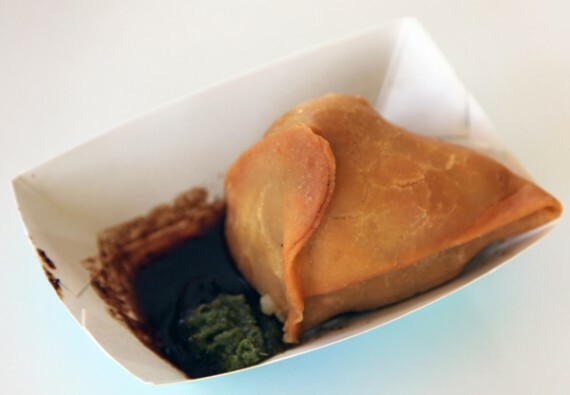 in case you haven’t heard, dosa truck is LA’s only vegetarian food truck and their menu is chock full of vegan options. i have been hitting up the truck on a regular basis lately, and while i think it’s a bit on the expensive side, the food is always pleasant. 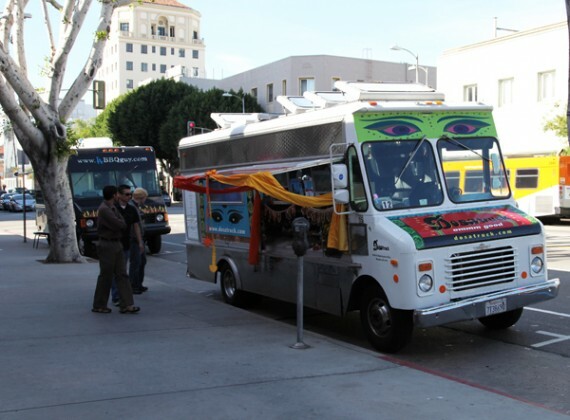 dosa truck is part of the huge twittering mobile food craze that’s hitting los angeles, but unlike the other businesses, this truck doesn’t serve meat. 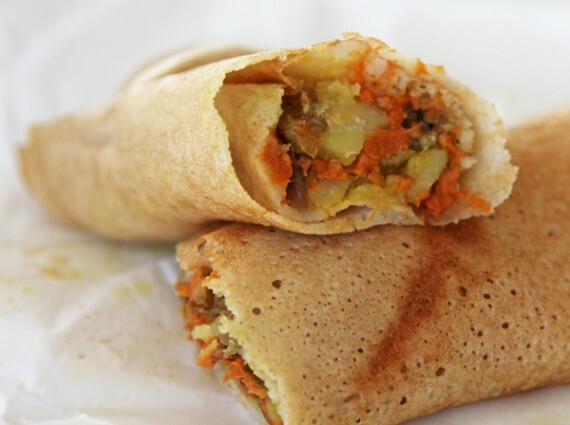 it specializes in all-vegetarian dosas, which are south indian-inspired crepes stuffed with various different fillings. although dosa truck does serve cheese in some of their dishes, the menu is super vegan-friendly, with all the stuff to avoid being pretty obvious (paneer, yogurt, etc). 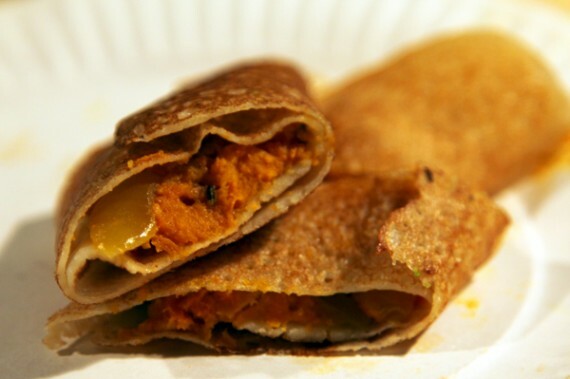 i hit up the food truck today at their stint in hollywood, and tried out 2 of their vegan dosas as well as a samosa. 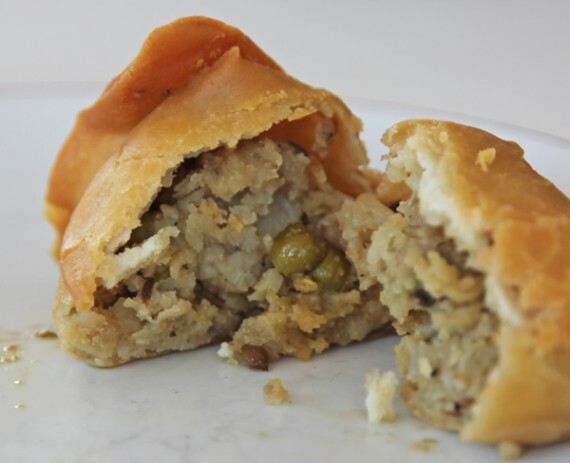 i also grabbed a samosa, the perfect little fried pocket of indian goodness. it was a great one too, with soft potatoes and juicy green peas. every bite of food i had at dosa truck was excellent, so seriously go show this vegetarian business some support! 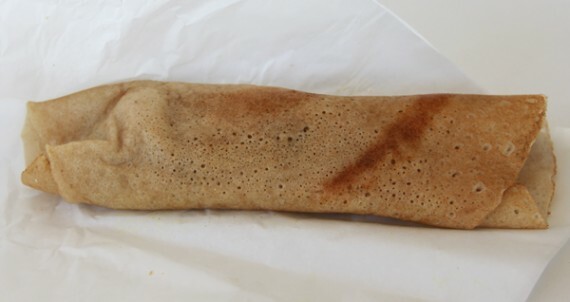 dosas are 6 bucks each, and worth every penny. and remember, no coconut chutney! you can get their schedule from their website. and be sure to follow them on twitter for updates.